"It's about making sure you surprise them, & they don't surprise you." That's an amazing quote by Jessica Chastain in Miss Sloane, the most important film of the year. 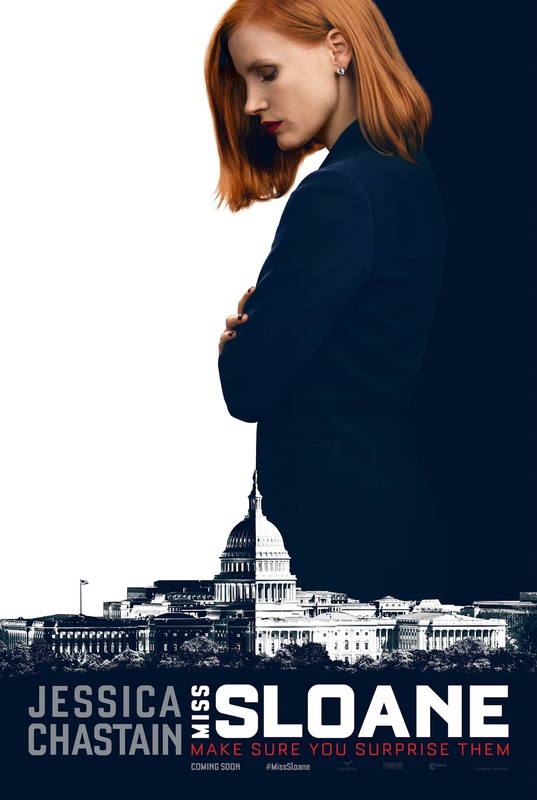 Chastain portrays Elizabeth Sloane, a political lobbyist in Washington, D.C. Known for cunning tactics, Sloane will stop at nothing to get what she wants. She works at a lobbying firm led by George Dupont (played by Sam Waterston), who is against a bill that requires strengthened background checks for gun purchases. Sloane is met by Dupont & a member of the gun lobby, who want her to go against the bill, to which Sloane declines. Sloane is then met by Rodolfo Schmidt (played by Mark Strong), president of Peterson Wyatt, another lobbying firm. Schmidt wants Sloane to help support the bill, to which Sloane agrees. Sloane quits Dupont's firm, taking several of their members with her, causing infuriation from Dupont & Pat Connors (played by Michael Stuhlbarg), a colleague of Sloane's. Sloane must now try to get 60 senators to support the bill, but a Congressional hearing about her tactics threatens to destroy her reputation & the bill. The cast is excellent, especially Chastain, who gives one of the best performances of the year. John Madden's direction is amazing, with this being his best film yet. Jonathan Perera's screenplay is brilliant. And the editing by Alexander Berner is excellent. This is the most important film of the year, as we are now in a country where politics is corrupt & diabolical, especially after this election.